Lord Krishna’s birth is celebrated in the hindi month of Bhadrapada. This is celebrated as the festival of Janmashtmi all over the India. This festival has a great significance as it underlines the importance of Shri Krishna – the eighth incarnation of Shri Vishnu. This religious festival is celebrated all over India in the month of August/September on the ashtami of Krishna Paksh or the eighth day in the month of Bhadon according to the Hindu calendar. Shri Krishna was born to Vasudev and Devaki. He is an incarnation of Vishnu dashavatar. Devaki was the sister of Kansa. Kansa was a sinful ruler of mathura. During the wedding of Devki and Vasudev, there was an akashvani that eighth child of Devki will kill Kansa. Kansa killed the first six children of Devki. 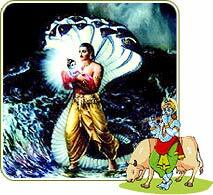 Seventh was Balrama, who was saved by divine forces and eighth was Shri Krishna. When Krishna was born in the prison, a chain of events happened, which surprised Vasudev. The gates of the cell flow open and all the guards fell asleep. Note: According to historians, the prison cell, popularly known as ‘Garbha Griha’, in the temple premise is the exact place where lord Krishna was born. This temple is known as Shri Krishna Janmabhoomi mandir The stone walled cell is reminiscent of the cruelty of King Kansa. Many statues and sculptures of the bygone era were found on excavating the site. The prison cell was gradually turned into the present beautiful temple. Lakhs of devotees throng the temple during Janmashtami. The festivities and celebrations during the festival is famous all over India. Celebrations begin during mid night with the birth of Bhagwan. Guards fell asleep, doors of prison opened on Krishna’s birth. He thought of Nand, his close friend in Gokul and decided to handover his child to him in order to save him from the clutch of Kansa. On that fateful night, heavy rains which led to river Yamuna being in floods. As soon as the feet of Lord touched the river, the flow became normal and Yamuna give way for the Lord. Sheshnag, the serpent formed an umbrella to save the new born baby from rain. He reached gokul. He kept his child next to fast asleep Yashoda and took the baby girl lying with him back to Mathura. The baby girl is believed to be the sister of Lord Vishnu. After vasudev reached Mathura, Kansa was given the news of birth of the eighth child of Devki and Vasudev. Kansa rushed to the prison-cell and lifted the baby girl to kill her despite pleadings from Devki. But, instead of hitting the stone, the girl flew up in the air and announced that the annihilator of Kansa was born and in safe hands. She was Yog maya. nice article and beautifully narrated with pictures.